The first of Drysdale pumps fitted with a new wear ring. Massive flooding took place in the Doncaster, UK area in June 2007 when 80 mm of rain fell in a 16 hour period. Amongst many domestic and commercial casualties was the Bentley Ings pumping station which suffered a power failure. The switchgear ended up submerged in water so the pumps, which had provided many years of reliable service, stopped operating. In response to this event, the pumping station's owners British Coal, through the Environment Agency (EA), instigated a programme of works to restore the pumping station to full operating capacity and improved efficiency. The switchgear was repositioned to a higher level and the pumps are undergoing a major refurbishment programme which will result in many more years of reliable operation. The refurbishment and retrofitting of three Drysdale 24 in vertical axial flow land drainage pumps and one dry weather pump incapacitated by the flood waters was awarded to AxFlow by the Environment Agency's contractor AMCO. “The first task was to remove the pumps from the site and transport them to our Huddersfield site,” reports Mark Redgrove at AxFlow. “Once we had the pumps back in our Huddersfield workshops and stripped down, we were able to assess their condition and recommend to AMCO what work needed to be carried out. In a situation such as this, the course of action often followed is either to go to the equipment manufacturer for remedial work or to purchase completely new pumps. Unfortunately, the first route was not an option as the manufacturer had long ceased to exist. The second course of action had to be considered, but on the advice of AxFlow's engineers, AMCO and the EA considered that this would not produce the best value for money over the long term. Given the age of the first two pumps to be inspected, the engineers felt that the job of improving pump efficiency would be a challenge. AxFlow also found that the dry weather or ‘summer’ pump had a smaller intake diameter than that of the discharge, a factor often associated with problems of cavitation, but easily remedied by throttling-off the intake. Looking at the pump end components, the impeller bush cap was found to have sheared its studs and was loose inside the pump. Consequently, the bearing and cap was badly worn. The No.2 pump required much of the same attention and work, but it was the clearance between the impeller and the wear ring that caused concern. When measured, the clearance measured 8 mm diameter, whereas the recommended clearance for this size of pump is typically around 1 mm diameter. 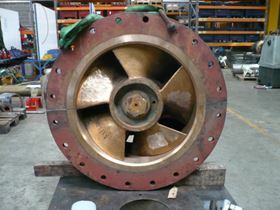 To rectify this, AxFlow replaced the wear ring, thus returning the clearance to the original diameter. The engineers also found that the pump end bearing was missing a sleeve, leaving a clearance of 3 mm between the bearing and the shaft journal. This problem was solved by rebuilding the shaft journal and re-metalling the bearing. The work undertaken addressed the engineering issues that would get the drainage pumps at Bentley Ings back into service and ensure a long and reliable working life. Featuring Ingersoll-Rand, ITT and Ebara.